The global image-guided surgery devices market is predicted to grow at 7.1% CAGR during the forecast period with the market size reaching USD 6.3 billion by 2024. Image-guided surgery is also known as navigation surgery, it visually correlates intraoperative anatomy with preoperative CT scan. Image-guided surgery devices are used for guiding surgeons during the surgery. It enhances accuracy during the surgery, decreases procedure time, reduces complexity, and insignificant surgical scar. Different products such as x-ray fluoroscopy, computed tomography, single-photon emission computed tomography, magnetic resonance imaging, and ultrasound are majorly contributing to the image-guided surgery devices market size. The market has witnessed significant demand for computed tomography over the last few years as it is used for diagnosing vascular diseases, cancer, and skeletal abnormalities. Based on product, the image-guided surgery devices market is categorized into x-ray fluoroscopy, computed tomography (CT), magnetic resonance imaging (MRI), ultrasound, endoscopes, single-photon emission computed tomography (SPECT), and positron emission tomography (PET), of which computed tomography hold the largest share in the image-guided surgery devices market, globally. The upsurge in the precision of the operating procedure has led to the fastest growth of the magnetic resonance imaging segment during the historical period, which is also predicted to continue during the forecast period. On the basis of the application, the image-guided surgery devices market is subdivided into cardiac surgery, urology, neurosurgery, oncology surgery, orthopedic surgery, gastroenterology, and others. Of all, the orthopedic surgery category is predicted to witness the highest CAGR during the forecast period due to expanding the geriatric population, and mounting occurrence of road accidents. Moreover, of all applications, neurosurgery category accounted the largest share in the image-guided surgery devices market due to an upsurge in the precision of the operating procedure, the mounting occurrence of neurological disorder and diseases, and least threat of injury to non-surgical sites in the brain. On the basis of the end user, the market is segmented into hospitals, ambulatory surgical centers (ASCs), and others. Of all, the image-guided surgery devices market size for ASCs is expected to grow at the fastest CAGR of 8.3% during the forecast period, globally. In addition, of all end users, hospitals accounted for the largest share of the market. 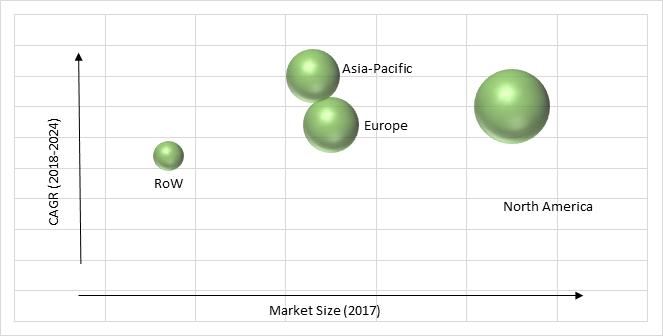 The mounting occurrence of neurological disorder, increasing demand and penetration of image-guided surgery devices in developing economies, expanding the geriatric population, mounting healthcare awareness, and intensifying healthcare expenditure are the key factors leading to the growth in the image-guided surgery devices market, globally. For instance, according to the World Health Organization (WHO), globally in 2010 approximately 524 million people were aged 65 years and older and is expected to reach 1.5 billion in 2050. The geriatric population is susceptible to neurological disorders moreover, the low immunity makes problematic for them to recover from the side-effects of invasive treatments, thus image-guided surgery devices are escalating demand for non-invasive surgery. Some of the other key factors driving the growth of the industry are the mounting occurrence of chronic diseases such as cancer, and technological developments in medical imaging. Key factors hindering the growth of the image-guided surgery devices market are the high cost of imaging technique, and strict regulatory requirement. In addition, the lack of awareness is also having a negative impact on the growth of the image-guided surgery devices market. Geographically, North America is the largest image-guided surgery devices market as the region is home to a large number of industry players and has a high frequency of acceptance of novel technologies. In addition, expanding geriatric population, escalating demand of non-invasive surgery, obtainability of skilled professionals, mounting healthcare awareness, intensifying demand of minimally invasive surgery, the mounting occurrence of neurological disorder, and escalating healthcare expenditure are also fueling the growth of the North American image-guided surgery devices market. Asia-Pacific is observed to witness significant growth in the image-guided surgery devices market during the forecast period, as the region comprises of a large population, and refining healthcare infrastructure. Moreover, expanding the geriatric population, intensifying demand for minimally invasive surgery, mounting healthcare awareness, and speedily increasing medical tourism are also facilitating the significant growth of Asia-Pacific image-guided surgery devices industry. Market players in the image-guided surgery devices industry are investing capital to develop technologically advanced systems. In June 2018, Royal Philips acquired EPD Solutions, to improve its product portfolio of image-guided procedures for cardiac arrhythmias. Siemens AG, Koninklijke Philips N.V, Medtronic Plc, Stryker Corporation, Hitachi, Ltd., Varian Medical Systems, Inc., Smith & Nephew plc, KARL STORZ GmbH & Co. KG., Zimmer Holdings, Inc., and General Electric are some of the key players offering solutions for image-guided surgery devices. 10.6. Varian Medical Systems, Inc.
10.8. KARL STORZ GmbH & Co. KG. Table 168 Snapshot – Hitachi Ltd.
Table 169 Snapshot – Varian Medical Systems Inc.
Table 172 Snapshot – KARL STORZ GmbH & Co. KG. Table 173 Snapshot – Zimmer Holdings Inc.